*A character’s species has no effect on her stats and only affects equipment options for winged characters. Elves have historically been the dominant species, but heritages have become very mixed over time and half-elves are most common at the game’s point of time in its universe. 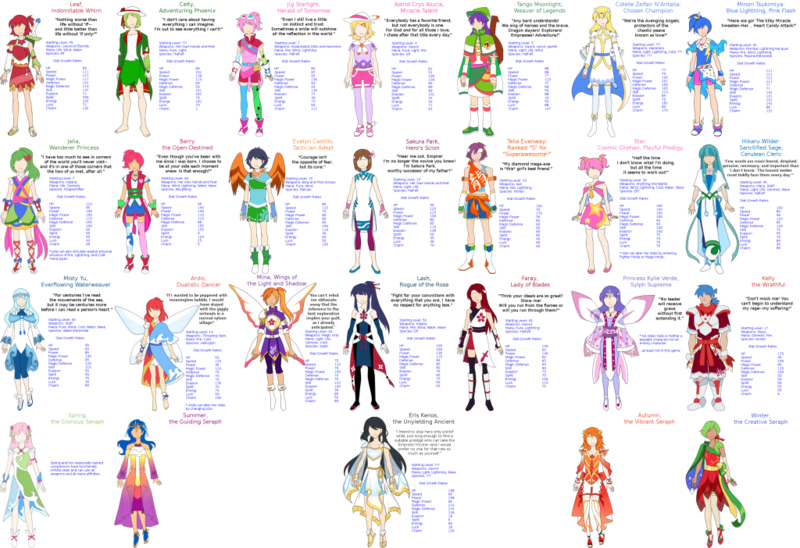 * Sylphs and the falician can have different types of wings within their own species. Both can produce offspring with elves, half-elves, and norians via magic, but the falician are much more desirable; half-sylphs like Ardis can’t shrink themselves enough to fit perfectly in a sylph village nor can they grow enough to imitate the height of even a falician. *Berry is a bio-being and one might wonder why she’d be classified as that or how it would be different from any other character. To that I say: I’ll leave that unexplained for now as a teaser! 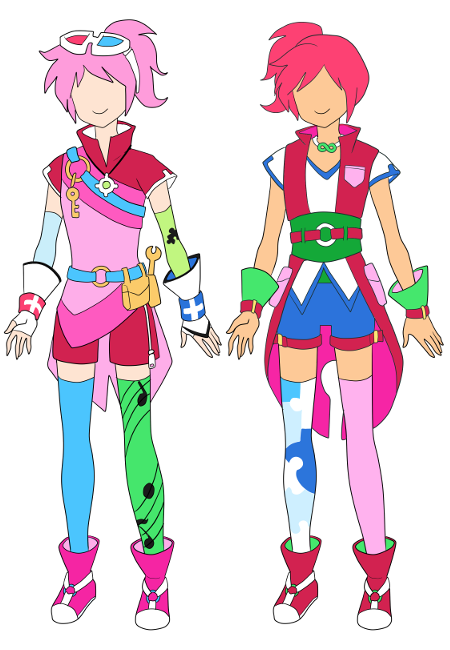 One thing I’ll explain, since I said I would, is that her clothes are designed by Jig and Jelia. Jelia’s pretty active on the designer front, by the way: she also made Tango’s kilt! * The gold flower symbol worn on Mina’s armband is the symbol of the Empire, but the red flower symbol shown on Mina, Lash, and Faray indicates a special status for them. Mina’s uniform is a standardized Imperial uniform for mage-class fighters; physical fighters have full-length pants instead because they don’t need as much exposure to the mana flow. (I continue rolling out all sorts of lore just as a sidebar!) 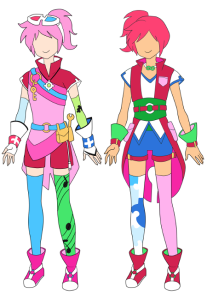 Evelyn and Sakura are also members of the Empire, so they often wear the uniforms too, but since the uniform only needed to be designed once, they’re shown in their civilian clothes. * Like in Magic: the Gathering, I’ve loosely grouped mana affinities by color, but I’ve also broken them up by shade. Pure magic is purple, Light magic is white, Life is light green, Genesis is deep green, Fire is red, Wind is light yellow, Lightning is deep yellow, Cold is light blue, Water is mid blue, and Wave is deep blue. Most characters can only use two colors, but might have access to multiple shades. As another thing that’s like Magic (or Pokémon for that matter), certain colors are more likely to pair up than others. Any shade is likely to pair up with another shade of its color (such as light yellow and deep yellow) and other common pairs include blue-white, blue-yellow, green-white, and red-yellow. Uncommon pairs include blue-red, green-red, and red-white. Just as a Fire/Ice Pokémon would seem unusual, Ardis’ ability to use Fire and Cold magic surprises others. * There are two types of stats: primary stats and secondary stats The primaries are HP, Speed, Power, Magic Power, Defense, and Magic Defense. Like in Pokémon, a score of 80-90 is passable, 91-100 is good, 101-120 is very good, and 121+ is great. (And yes, I’ll have to make bar graphs and such to show all of this visually at some point.) The secondary stats are Skill, Evasion, Spirit, Energy, Luck, and Charm. Of these, Skill, Evasion, and Charm are on a similar curve as the primary stats, but slightly lower. For Spirit, Energy, and Luck, the numbers tend to be much lower on average; anything at 70 or above is excellent. * But what do all these stats do anyway? HP is your basic life total, Speed controls turn order, Power and Magic Power determine the strength of your physical and magic attacks, and Defense and Magic Defense offset the strength of enemy attacks. As for the other stats, I call them “Secondary” because I don’t want players to worry too much about them; they’re fairly complicated. For the sake of completion, though… Health regeneration is based on Spirit, move usage regeneration is based on Energy, and critical hit rate is based on Luck. Resistance to physical status effects is based on a combination of Spirit and Charm. Resistance to magic status effects comes from Energy and Charm. Hit rate is based on Skill, Charm, and Luck in that order of importance; dodge rate is based on Evasion, Luck, and Charm. Damage done by energy-based attacks depends on Spirit and Energy as well as some of the primary stats. Skill and Evasion give minor boosts to attack power and defense respectively (both physical and magical). And, finally, Spirit and Energy contribute to a pretty novel battle mechanic I have that only kicks in during certain boss battles… Another teaser. Well… I suppose that’s enough for now! 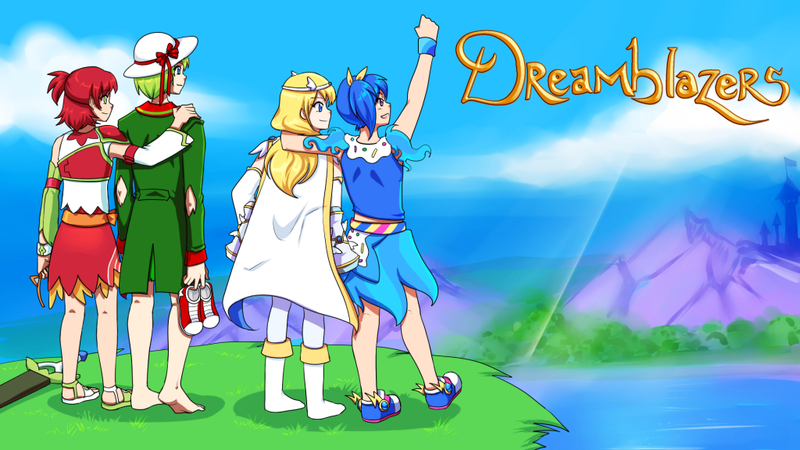 This entry was posted in Devlogs, Dreamblazers and tagged Magic, Pokémon on December 29, 2014 by JellyPaladin. Back to the animation grind! Here are Jig and Berry, the final character designs to be added before I finish a playable prototype! Jig, shown on the left, was going to be the very last one, but Berry emergently popped into existence during my coloring process when that red jacket looked amazing but didn’t seem right on Jig. But who is Berry and why does she look so similar to Jig? Find out on the next exciting episode of Dragonb—uh, I mean, Dreamblazers devlogs! I also hope that writing isn’t a slog. As a creative person, I do love my characters (10 hours playing with the fill tool for Jig, 2000 words of feedback for Cotelle…). As a gamer, I realize that others will mash through cutscenes without caring just like I do. It’s a tough balance. Bestiary flavor text is/was my favorite, though: I draw a lot of inspiration from Pokémon, so I consider it important to ask what monsters do when you’re not fighting them. Answering that question brings a sense of cohesion to the game universe, but it always feels iffy to insert that into mandatory dialogue, so bestiaries are where it’s at. Since today concludes the character designs other than small tweaks, at some point in the next few weeks I’ll have an organized picture with characters grouped according to their relationships instead of shown in the order they were completed as they are now. They’ll also have mini-profiles with stuff like character classes and species, plus more characters will be showing their nicknames (“Hikaru Wilder, Cerulean Cleric”), not only the seraphic sisters, Imperial agents, and Kelly. 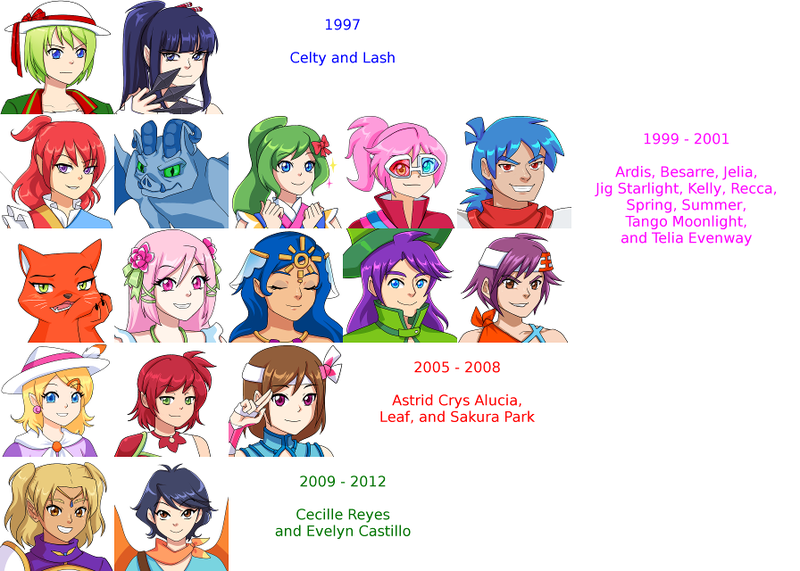 I might even have fun facts and trivia about some characters’ creation and what they’ve meant to me over the years! For example, today’s Berry was inspired by Dragonball Z way back in the late 90s and she’s been a part of my Dragon Quest IX and Etrian Odyssey III parties. That kind of stuff used to go on my wiki, but somehow my own wiki has locked me out of editing it right now, so until I get that resolved, I can put it here instead. Why do this all of a sudden, though? Because once the title screen image is finished, I’ll be taking things more public (very slightly more public) and posting in the Showcase section of the ORK forum! This entry was posted in Devlogs, Dreamblazers and tagged Dragon Quest, Dragonball, Etrian Odyssey, Pokémon on December 15, 2014 by JellyPaladin.